The St Enoch Shopping Centre in Glasgow is Europe's largest glass structure. It has over 75 shops, a merchandising area, and a massive food court and car parking space for 750 cars. Set just off Argyle Street in Glasgow the St Enoch Centre is a great place for shopping, going for some lunch or meeting up with friends and family for a day out exploring all the great stores within. There are many great high street stores, a great selection of huge toyshops, jewellery outlets and art shops also. 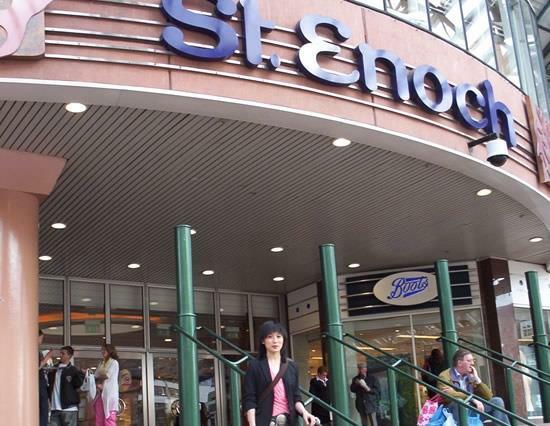 If you are looking for a great shopping trip then St Enoch's is a must visit venue. When you are perhaps tired out from the shopping and your legs need a rest there is a phenomenal range of eateries from your local high street food outlets to Chinese restaurants, pizza places and sandwich shops. The great design of the St Enoch shopping centre means that regardless of the weather you can bring the outdoors indoors with the fantastic natural light which floods in. A great day out for dining, shopping and fun!.